The Nationals were a unanimous pick to win the National League East by the Globe staff. AL East: Orioles – Why does everyone think the Red Sox made up 25 games on these guys? AL Central: Tigers – Not done yet. AL West: Angels – Mike Scioscia keeps these guys in the tournament. AL wild card: Indians, Red Sox – Tito gives his regards to Sox owners again in playoffs. NL Central: Cubs – Theo, Jon Lester . . . Why can’t we get GMs and aces like that? NL wild card: Giants, Pirates – Champs still in playoffs; Former BC catcher Tony Sanchez breaks out. World Series: Nationals over Orioles in 7 – Beltway Series unites all houses. AL Central: White Sox – Superb top three starters (Chris Sale, Jeff Samardzija and Jose Quintana). AL West: Mariners – Very good pitching staff 1-12 and enhanced power with Nelson Cruz. AL wild card: Angels, Tigers – The Angels still have overall talent; Tigers continue to ignore their bullpen. NL East: Nationals – Don’t envision starting rotation letting anyone down and Bryce Harper becomes a star. NL Central: Pirates – Nice blend of pitching and offense. Pirates finally have it together. NL West: Dodgers – Not a solid choice but this division has flaws. NL wild card: Cardinals, Giants – Doubt Giants get to World Serie; Cardinals don’t have enough power. World Series: Nationals over Mariners in 6 – The Nationals can’t possibly lose with that pitching staff. AL East: Orioles – Baltimore gets a big boost from Manny Machado’s return. AL Central: Tigers – They are not what they once were, but still formidable. AL West: Mariners – Seattle has a much deeper lineup around Robinson Cano. AL wild card: Indians, Angels – The Sox will compete, but the loss of Christian Vazquez was a killer. 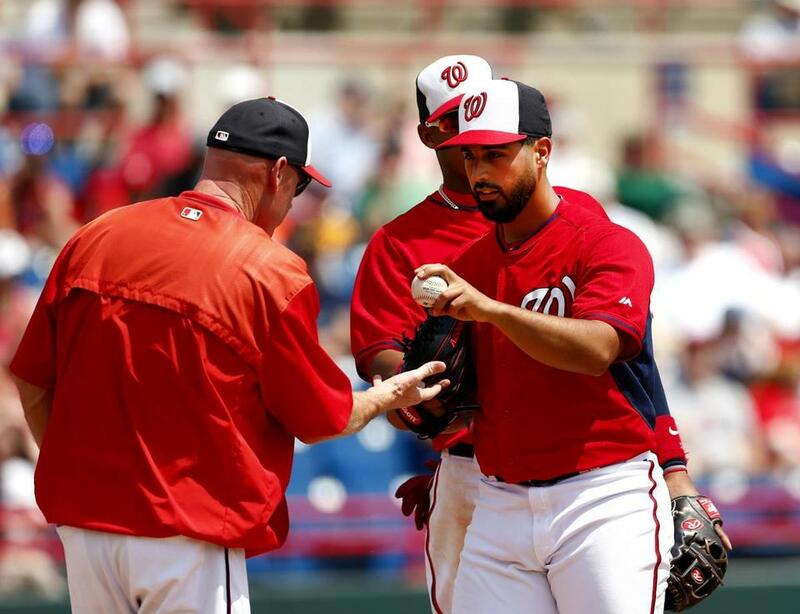 NL East: Nationals – They’re built to win now with that rotation. NL West: Dodgers – A quiet but effective offseason put them in good position. NL wild card: Marlins, Cardinals – The young Marlins and older Cardinals sneak in. World Series: Nationals over Mariners in 6 – In a playoff series, it will be tough to beat the Washington starters. AL East: Blue Jays – The Blue Jays end the longest playoff drought in major North American pro sports. AL Central: Indians – In Terry Francona I trust. It helps to have Cy Young winner Corey Kluber too. AL West: Angels – Mike Trout and the Halos can mash. They led MLB in runs in 2014. AL wild card: Mariners, Tigers – Mariners’ defense is almost as good as Pete Carroll’s. Tigers edge Red Sox for final wild card. NL East: Nationals – The anti-Red Sox, Nationals should have “Everyone is an Ace” T-shirts. NL West: Dodgers – Let’s see what former Rays GM Andrew Friedman does with the Dodgers’ deep pockets. NL wild card: Padres, Pirates – Padres’ offseason splurge pays off. Bucs make it three straight postseasons. World Series: Nationals over Tigers in 7 – Someone in Washington finally delivers on their promise. AL East: Red Sox – Offense will keep scoreboard busy, but pitching reinforcements required. AL Central: Royals – Yordano surpasses Robin, Jesse and that highway as most impressive Ventura. AL West: Mariners – First 20-win season and second Cy Young for King Felix. AL wild card: Athletics, White Sox – Billy Beane’s bewildering offseason moves pay off. Carlos Rodon electrifies. NL East: Nationals – How’s this for pitching depth? Sixth starter Tanner Roark might be Red Sox’ ace. NL Central: Cubs – Lester/Arrieta form best Northside 1-2 punch since Greg Maddux/anyone else. NL West: Dodgers – Clayton Kershaw’s most similar statistical pitching comp? Babe Ruth. NL wild card: Marlins, Pirates – Giancarlo Stanton wallops 50 homers. Marte-McCutchen-Polanco NL’s finest outfield. World Series: Pirates over Red Sox in 6 – Pittsburgh finally avenges 1903 loss to Boston. Shall we meet again in 2127? AL Central: White Sox – Winners of the offseason win in the season. Al West: Mariners – Felix Hernandez finally pitches in the postseason. AL wild card: Yankees, Angels – Yankees staff surprises with health; Trout helps Halos get past. NL East: Nationals – Loaded rotation, loaded lineup. NL Central: Cardinals – The class of the division till proven otherwise. NL West: Dodgers – Too much talent for the rest of the division. NL wild card: Marlins, Pirates – There is no such thing as small-revenue teams anymore. World Series: Nationals over Mariners in 5 – Scott Boras hailed as conquering hero as client-loaded Nats triumph. How exactly did David become 'Big Papi'? How much have defensive shifts really hurt David Ortiz?